Minneapolis curator and arts writer Tricia Khutoretsky interviews photographer Nina Berman for 10 Years + Counting. Nina begun taking photographs 10 years ago, and has since been working on ongoing documentation of America since the invasion of Afghanistan. Photographs are often a glimpse into the past, a way to remember and a way to record. Nina Berman’s award-winning and internationally exhibited documentary photographs however seem to hold a sort of timelessness. Perhaps this is because many of the images she captures are of our country changed by a war that is equally endless. 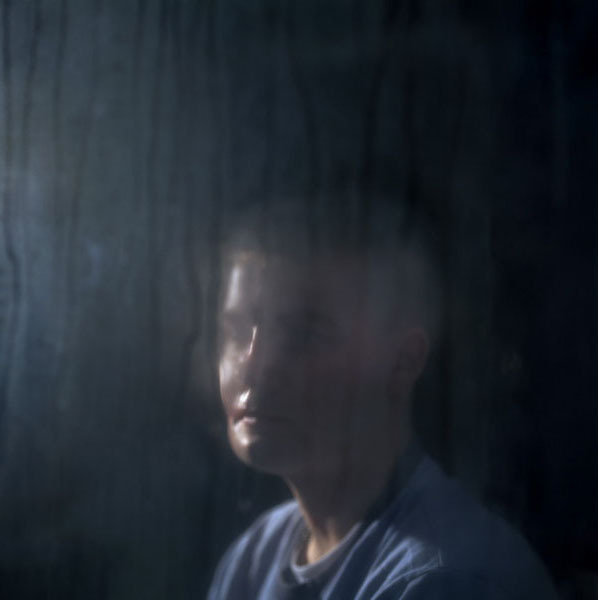 From the legacy left on war veteran’s bodies and minds, to images taken in Afghanistan pre-invasion, or her exploration into America’s troubling ideological landscape… her photographs attempt to understand subjects that she feels personally curious about. That genuine search for deeper insight translates visually in a way that is memorable and provoking. In the following interview, Nina and I converse about the coinciding 10 year anniversary of the invasion of Afghanistan and the stories and motivations behind her decade long study of a nation at war. How do you feel about the 10-year anniversary of Afghanistan? From your perspective, how do you think people will react on that day, if at all? I imagine that most people don’t know the significance of that day, I’m assuming that it will go unnoticed. I imagine that some troops who participated will probably remember it. I imagine the people of Afghanistan will certainly remember it whether or not there will be public remembrance. I had written a previous piece on my blog mentioning that day and when I turned it in to editors, they didn’t understand what the day was, it’s not marked in our public conversation. Days of invasion aren’t really recognized in our culture, it seems to be more about the days we ourselves were attacked… although that isn’t entirely true…D-Day is a big moment in our history. Maybe 10 years is too soon, for this day to be marked in our history? And perhaps it is because the war is still ongoing? Yea, I think it is because the war itself is so mysterious– the purpose of it’s origin, why we went, what we wanted to accomplish, who we’ve killed, the money we’ve spent, the lives we’ve lost. All of these things are unknown and there isn’t any serious conversation about it. It is becoming more chronic and endemic. I could see this war going on forever. Considering how unknown the war and places like Afghanistan are, I’m curious about your series Under Taliban, in which you photographed Afghani women. How did you manage to gain access to create such intimate images? Well, those pictures were taken before the U.S. invaded. They were taken in the 90’s, which is interesting because many people find them to be contemporary present images because they are very similar to what we see now. But they were actually taken in 1998 and 2000. If you look back at the justification for invading Afghanistan, part of the reason we were told that we needed to go there was to liberate women. America dropped some strange propaganda during those early bombing raids. Some things have gotten better for certain classes of women since we’ve been there. But the idea of one country invading another country to liberate half their population overnight is insanity, in my mind. 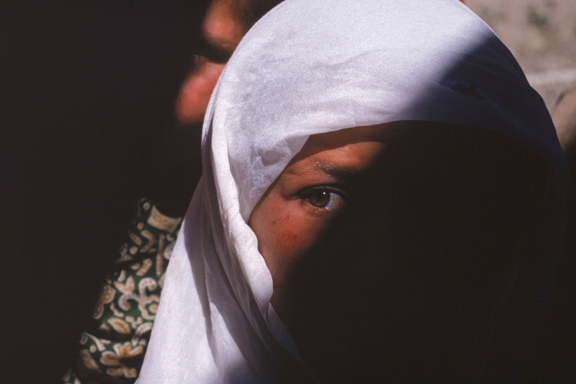 My pictures were mainly taken in Kabul dealing with issues of poverty and oppression. These are still issues in Afghanistan, 10 years of war hasn’t been able to change that, but I haven’t been back since 2000 and I only know this from friends who are there. There are always 2 sides of a story which brings me to wonder about your Homeland series, where you turn the lens away from the Middle East and focus on what is going on here in the U.S. over the past 10 years, and how the war has affected us at home since 9/11. With Homeland…I think there are certain mythologies and narratives that we have been told since 9/11 and are still told today. I hope that the best of my photographs give viewers a path into reconsidering these mythologies and narratives in a way that doesn’t demean the subjects but personally connects you. In the U.S. we are told stories: we are the greatest country in the world, we are especially blessed by god, we are the only superpower in the world, and that what we say is more correct and more enlightened than what other people say. Because of this special quality of America we are allowed to do things. I hope that my pictures show what happens when this ideology is subscribed to. 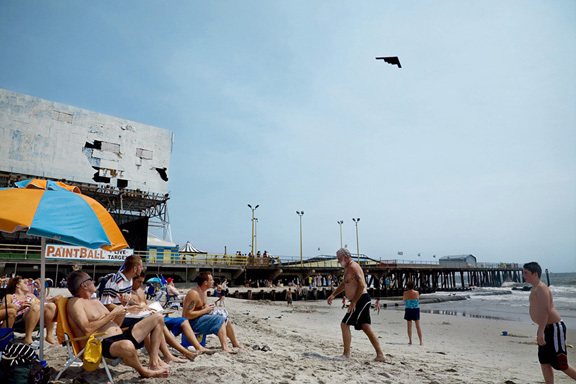 You’ve been photographing the effects of 9/11 on Americans for 10 years now. Besides the actual events of that day, what instigated your exploration into issues about the reality of war? 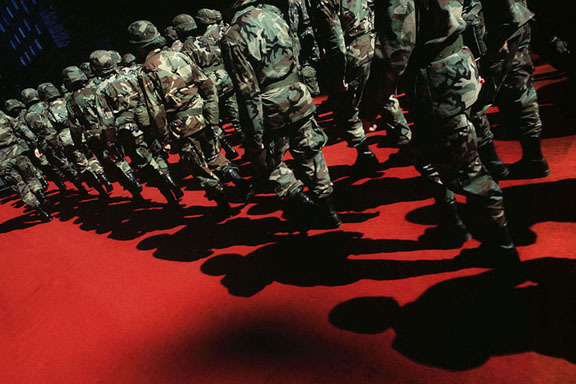 The first picture I took for the Homeland book, of soldiers on a red carpet, is in response to the invasion of Afghanistan. It was taken on a Monday, and I believe that we started bombing Afghanistan on a Friday or Saturday, so it was taken just a few days before that. I looked at that photograph searching for any manifestation of the invasion. When you take pictures they lead you to think about other things. That particular picture was an important wake up call for me. It showed the military on the red carpet, did it signify royalty? Are these humans or mechanized beings? The colors are so crazy rich and it was a perfect day. It was taken at the Columbus Day parade in New York, which happens every year but that particular year the parade seemed far more militarized. These are the kind of things that I was thinking when I took it. That photo was my way into this project, which has now lasted 10 years. Looking through your photographs from the past 10 years, I looked lastly at the Hedge series taken inside Wall Street. These photos seem different to me, with more focus on lights, color, and abstraction. What insight can you give me into your narrative with this series? I’ve been interested in the idea that money has value and no value. Much of the way the world is shaped now is through computer screens. Some of the most powerful people in the world get that power through those screens. As an ignorant outsider, the screens are just a series of numbers, colors, shapes in a completely impenetrable world. Yet this is the world that drives so much of our economy and our choices. I wanted a way in, to see if I could make something that suggested a casino/narcotic like aspect to the financial market. It occurred to me after the financial crisis that I could photograph people losing their homes… but they’re just the victims for the most part. I don’t want to just photograph victims of things, in some ways that’s a cop out. You start to think the victims are the perpetrators if that’s all you see. I wanted to find some other way into the landscape of Wall Street, it’s like a theme park down there. You don’t really get a sense of what happens just being outside on the streets. I noticed so much detachment in those images. I was drawn into those photographs because they seem unique in viewpoint within the context of the rest of your work, but yet there is a unifying thread. I don’t know if it comes through in Hedge, but I’m also interested in the traders, who spend 12-14 hours a day looking at this stuff, they sort of meld into the machinery. They buy into whatever their system is, to become a billionaire on Wall Street, through a machine. People make more money on those machines in a day than I make in a year, it’s beyond comprehension. In some ways its similar to some of the veterans I photographed. The veterans also bought into a belief system, they made certain compromises or assertions. So then how does that become mapped on them, on their bodies and on who they are? I think if you look at all my work there is a connection between the individual and a prevailing ideology. Speaking of the veterans you have photographed…the Marine Wedding photos are an intense example of impact on the individual. I can look at photographs of this severely disfigured veteran, and yet if I saw him in person I don’t think I would know how to react or where to look. What did you feel when you photographed him? I don’t have that reaction when I look at disfigurement. I maybe have a flash of hesitation and then I become very interested. Not voyeuristically, but more like: who is this person and how do I get beyond this very physical nature? But I did have years of preparation. I remember being at Walter Reed seeing a bunch of young men in wheelchairs, feeling like I wanted to weep and trying to contain myself. I have images of scenes from that place that I couldn’t photograph but that I still have in my head, that totally freaked me out. But not because a person’s face was blown off, because there was something else going on that made me feel sad. Given those experiences and the photographs you have taken, what is it that you want people to know or think about war veterans? I think for me, the most important take away is that we tend to think of war as something that happens and then it doesn’t happen anymore, a finite thing. I hope people will realize that not only is there an enduring legacy with individuals, but if you talk to anyone that is related to a war vet, it changes the whole dynamic of a family, sometimes in a positive way but lots of times not. I hope when people look at the pictures they see war in a much more serious and more personal way. It’s not just something that people debate in Congress. That sounds kind of simplistic, but really that is much of my intention, to show that the aftermath is enduring. I often think about the intentions of photographers who take photos as both a profession and an art form. Recently, I listened to a panel discussion about art and war where panelists talked about photographs, and how bombarded we are as a society with digital photographs daily. As a photographer in this reality, how does this influence your choices? In terms of the sheer number of images that are out there, I think in some ways it is a really good thing. The idea of people being able to express their reality around them with images is a fine and admirable notion. But for those of us who see ourselves as commentators, analyzers and in some ways mediators– it means that you have to be far brighter and much more intentional about what you are putting out there. It raises the bar much higher to make your work rise above the endless flux of millions of images. One thing that has been lost with the digitization of photography though, is a corresponding increase in really smart curators and editors. Instead we have photo streams and flickr pages and these are totally unedited. We need curators and editors, if you look at what’s happened since 9/11, the most interesting things are happening in gallery spaces. Not in the newspapers, not on television, not in the places that we used to look, but instead from people who have taken a long-term look at this and said, let’s really present something instead of just flashing it up on a page for 3 seconds. That’s what I look for when I look at photographs. What’s the vision, what are they trying to say? Is it just a nicely composed image, because for me that’s not enough at all anymore. The idea of gallery space as a place to learn truth is important, and I’m curious about your experience with the Whitney Biennale. Tell me more about showing photographs in a space where people could take time with them, rather than online or in a publication. What difference did that make to you? For me, those spaces are the most important venues. Even though I come from a place of photojournalism working for magazines I don’t see them, at least not the mass-market ones, presenting photography in a way that works for me. I don’t like stories sandwiched in between stories… like this story is about taxes, and then this story is about the busted up veteran and this story is about how to lose weight. I want to get away from that. In a space like the Whitney, people go in to take some time and consider things. It blows my mind that I still see people going into art museums. How amazing that is, just to spend an hour or the day, and see what I can feel and see what I can think. It’s absolutely beautiful. I work really hard to make sure I can show my work at venues, because it’s not something that is financially rewarding. When I see people going into a place like the Whitney Biennale or other galleries I am personally grateful that they take time to do that. What’s coming up next for you, what projects are you working on? After the Homeland book, which came out in 2008, I joined a photo collective based in Amsterdam called NOOR, made up of 10 international photographers. In conjunction with this group, I started to see if I could work on something else other than American politics and issues of war. I thought about the environment and tried to explore what would be interesting and challenging, something that doesn’t repeat what other people do. Right now I’m working on a project on gas drilling and I feel like I have finally found my creative spot. Sometimes that takes me a long time. I’m looking at this whole fracking process, which sounds technical and boring, but I’m coming at it from a different angle. I hope to get those pictures on my site and start looking for exhibition venues at the end of year. What motivated you to find an outlet that takes you away from the war and political images? There was a danger that I was starting to repeat myself. There is still one project that I want to do and that might be the end of this war series, but I don’t know. Maybe it is something I’ll do all my life. I also live in a time when the world is on the brink environmentally and I want to see if I can approach that photographically because it is something that I think about a lot. I usually approach projects that have to do with things that I can’t stop thinking about, I feel confused about or uncertain. 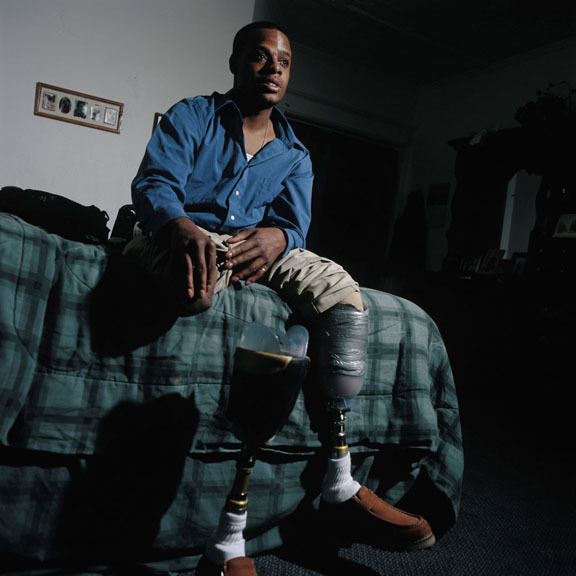 I started photographing veterans because I didn’t want to be just another zombie watching TV not being engaged. I wanted to see what this personal experience was about, who are these people who are going to war and what does it mean to be wounded and how can I connect with them? Fracking is a big issue in Pennsylvania and it will be in New York State any day now. This is where I live, this is my water supply and my air, I should be engaged and involved with it, so that is what I am doing. All photos credit of Nina Berman/NOOR images. For more information about Nina and her work, visit: www.ninaberman.com. This entry was posted in Uncategorized and tagged Nina Berman, photography, Tricia Khutoretsky. Bookmark the permalink.